Whirlpool baths, which are often referred to as Jacuzzi baths after the Jacuzzi brand, combine water or air jets with a bath to provide a massage system that will help ease soar and aching muscles as you enjoy a long soak in the hot bath. Whirlpool baths are a popular addition to a bathroom in place of a standard bath. However, careful attention should be paid to the practical considerations and build quality of the whirlpool bath so you can enjoy many happy years from your new whirlpool. Perhaps the most important consideration when deciding the design and bath styling is where it will be installed. This will quickly provide the maximum size of the bath in both dimensions and whether there are any restrictions due to a toilet or wash basin etc. The installation location may also impose requirements on the shape of the bath (e.g., rectangular, corner, circular) as well as its overall sizing. In addition, a larger bath will hold more water and its overall weight will be increased. It may be necessary to check whether the floor of the installation location needs any reinforcement to support this extra weight. 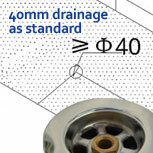 If in doubt, check the weight of the bath when filled with water and get the advice of a structural engineer. Ask yourself who will use the bath and how often the bath will be used. This will help you decide whether you opt for a single person or two-person bath. A child may comfortably fit into a small bath now but will this be the case in 5 years time? Typically, a hot bath will comprise of 1/3 cold water and 2/3 hot water from your boiler or hot water tank. If you have a hot water tank then what is its capacity? Will there be enough hot water in this tank to fill 2/3 of the bath that you are interested in purchasing? Recessed: A bath that has one finished apron and 3 open sides that is designed to be installed in an alcove. Drop-in: Either installed in a raised platform or sunk below the floor level. Typically, these baths have no aprons and can be tiled or finished using a décor that matches the bathroom and provides a popular bespoke finish for whirlpool baths. Corner: Typically, a finished corner or crescent-shaped apron on the front with two open sides against the walls. Freestanding: These baths will be finished on all sides (often with legs) allowing them to be installed off of the wall. 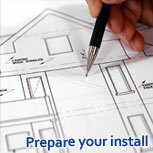 Make sure you have suitable drainage and water supply piping at your chosen installation point. In addition, consider access of the bath piping for maintenance should a problem occur. In most situations a drain can be moved or a natural recess below the bath can allow pipes to run to the rooms drainage point. However, in some situations it can be very costly or prohibitive to move the drainage point. Therefore, in these cases your choice of whirlpool bath may be affected. 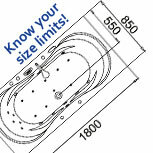 Usually, a whirlpool bath will come as one complete piece that cannot be broken down into smaller sections. Therefore, when refurbishing it is important to check whether the bath will fit through all doorways, around corners and hallways when manoeuvring the bath to its chosen location. For a new build it may be necessary to move a large bath into the room before the wall or doorway is finished. A majority of the Di Vapor whirlpool baths use a 1HP water pump and 0.5HP air pump. In the scenario where the pumps are operating at a combined 1.5HP this would equate to 1.5 x 746 Watts = 1.12KW. Therefore, operating the bath jets for 30 minutes at 10p per kWh would cost just 5.6p. 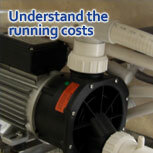 The other main cost would relate to heating the water using your boiler system. Typically, a whirlpool bath is designed to be emptied of its water once you have finished a bathing session. 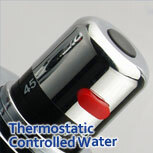 Therefore, a water heater is not necessary as hot water can always be added during the bath session. However, the air below the bath that is drawn into the air pump will generally be warm and the process of pushing the water through the water pump can have a heating affect due to the friction, which will help slow the natural cooling process of the water. 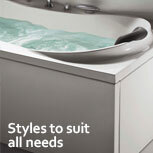 To save money, many suppliers carry limited baths in-stock. Once they aggregate enough orders they will then start your order. Be careful as this will result in a long lead time of 8-12+ weeks and often further delays can be incurred due to unforeseen circumstances. 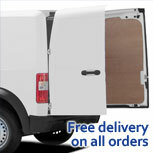 A bath will constitute a bulky and heavy item that will cost a significant amount to deliver. When comparing prices look to see if the price includes both VAT and delivery as this can considerably affect the final price. Insulation - Unlike metallic materials, acrylic is a poor heat conductor and therefore an insulator, which will help keep the bath water warm for a longer period of time. Warm to touch - Due to acrylic being a poor heat conductor, acrylic will be more comfortable to touch or lean against while in the bath. Durable - Acrylic is a very long lasting material and will provide a good finish for many years. 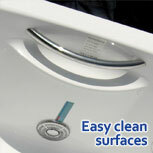 Easy Clean - An acrylic surface is smooth and is easily cleaned by simply wiping with a mild-household cleaner. Non-fading - Di Vapor has specially sourced a high quality acrylic that will not fade over time, whilst having greater fire retardation and strength properties. Easy Repair - A scratch can be an aesthetic nightmare to remove from many materials. However, acrylic can easily be sanded using a fine sand-paper and once buffed will result in a finish similar to a brand-new bath. Acrylic Reinforcement & Fibreglass - To save money some manufacturers will employ a composite material consisting of an ABS sheet with an acrylic PMMA sheet. 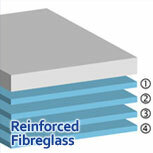 This will result in a weaker material that will not provide the same benefits of a solid acrylic sheet. Acrylic Colour check - Acrylic quality can vary considerably. One simple check that can be done is to look at the brightness of the finish. Typically, a poor quality acrylic has other materials mixed into it that results in a very bright white finish that will decrease flame-retardation and likely clash with other bathroom items. 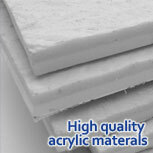 Acrylic Price - Acrylic prices vary based upon the quality, durability and resistance to fading. Some manufacturers use acrylic costing £777 per tonne, while others use acrylic costing £971-£1,035 per tonne. Di Vapor uses a high quality acrylic costing £1618 per tonne. Structural support frame - Does the bath have a strong frame and from what material is this frame constructed? Will it rust away over time? Is it flimsy? These are a few questions to consider. Di Vapor uses a strong 2-3mm thick stainless steel material to create the frame that runs all around the bath. 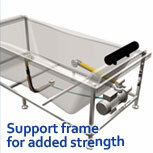 In addition, the frame has adjustable legs to make sure the bath is flat. Valves - To cut costs a valve can be made from plastic. 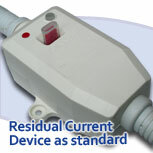 Di Vapor uses ceramic inside its thermostatic valves to guarantee the maximum lifetime. 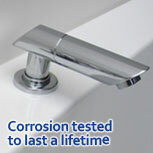 Corrosion testing - The last thing you want is for the shiny chrome surfaces of your taps to peal off after a couple of months of use. Using special salt-spray and corrosion equipment Di Vapor tests its chrome plating to make sure it keeps that shiny finish for as long as possible. Operational testing - To ensure that all taps, jets and electrics are working correctly it is important to carefully test the unit before it leaves the factory. Each Di Vapor product is thoroughly tested to ensure all working parts are fully functional before shipping. Thermostatic Temperature Control - This will mix the hot and cold water to a specific temperature before it enters the bath. The valve regulates the water temperature to eliminate dangerous fluctuations that could scald, while also adding convenience. Water Massage System - A water jet system is standard with most whirlpool baths where water is drawn into a water pump and forced out through jets that line the sides of the bath. The Di Vapor whirlpool baths often have two types of water jets: large positionable jets around the sides and smaller back water jets. Adjustable Water Jets - The ability to vary a water jets intensity is fundamental to maximising your hydro-massage experience. A special dial varies the speed at which water is pushed out through the water jets. Check that all jets are adjustable. Air Massage System - An air jet system provides an extra massage option with a completely different experience. Air is blown up through the water from underneath the user and is in addition to the water jets that line the sides of the bath. 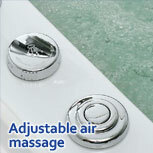 Di Vapor provides a majority of its whirlpool baths with both a water massage and air massage system. Adjustable Air Jets - Di Vapor employs a digital control system that allows you to control the intensity of the streams of air that bubbles up through the water. Cleaning System - This feature has been specially designed to clean the pipes that circulate the water around the whirlpool bath. Simply unscrew the lid and put in a suitable cleaning solution and then run the cleaning system with the control panel as directed. Underwater lighting - Underwater lighting is an aesthetic feature that will help create an ambience to compliment the bubbling water. The lighting can be coloured or white depending upon the chosen model. Handheld shower - Enabling you to wash off any left over suds or bubble-bath, this is a highly desirable feature. Air regulator - To help avoid problems where the back jets can be blocked by a larger user, the air-regulator will diffuse the extra pressure and allow the bath to continue normal operation. 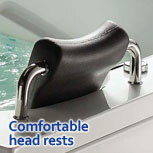 Foam headrest - For added comfort check that the whirlpool bath has a durable, water-proof, padding headrest. To protect the water pump from being operated with the absence or lack of sufficient water, a sensor can detect the current water level. This will help protect both the water pump itself and the user before and during the hydromassage session. This simple device is important where water and electricity have the chance of coming into direct contact. An RCD will immediately turn-off all power to the unit if an imbalance in the phase of the current is detected. Make sure you have an RCD installed. It is important that you buy from a company that you believe will still be in business for the foreseeable future so you can get spare parts and to service your warranty should a problem become evident. There are many cheap suppliers in the market who will provide a guarantee but may not actually be in business should a problem arise. Electrical safety is of paramount importance, especially with products used in your bathroom environment. You do not want to find that you have a beautiful new product in your home only to find that it is a safety hazard to both you and your family. 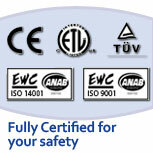 Check for safety certificates that are verified by a third party. For example, stating CE compliance is only the manufacturers word and does not indicate this has been externally verified. Each Di Vapor bath complies to the following safety standards: EMC electromagnetic compatibility, ETS (Electronic Technology Systems), CE, ISO 9001:2000 and ISO 14001:2004.